Blizzard conditions were expected on my return even before take off from home, but this only added an extra incentive for me to slip out Nebraska for a quick trip of gem gathering. The city of Tucson explodes with precious gems along its wide, easy streets. 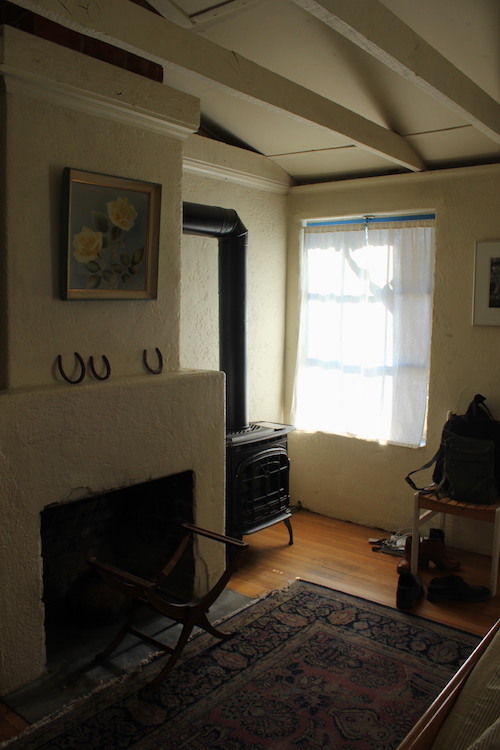 Tucson is a favorite destination of mine with its quiet calm and warmth. Buildings comfortably settled into spaces to breathe, aged by heat into varying shades of terracotta. Mountain ranges sprout out from the ground around the city, and the winter months make them sultry in dusky hues. The annual Rock & Gem show of Tucson is boasted as the largest gem show in the world. Easily there are thousands individual booths and venders scattered all over the city. Located in convention halls, ballrooms, arenas, motels taken over by vendors with their doors open to allow in the wandering patrons. Tents popped up in parking swarming with cars and people digging through piles of gems on tables, an outdoor bazaar of gems and fossils. The overabundance of riches contrast sharply against the chaotic flea market feel; the experience is surreal. Becoming desensitized to such beauty and richness is a strange sensation, but it happens quickly. Trying to process such abundance is overwhelming, my default becomes to stop thinking and allow myself to drawn in to vibrant shades of turquoise, druzy pieces of geodes from Uruguay, star clusters of rutilated quartz and tourmaline. The weight, feel, and movement of the gem is a core element of design when creating something to be worn and be functional. Each piece collected is held and considered to what direction and place it will take me. Northern Arizona’s canyons called to me this year, and road trips are something I relish. The blizzards forecasted to pummel Omaha later in the week were brewing in the mountain ranges as my intern and I drove across the state. The high altitude snow was blinding at times, arid and dry, intermittently appearing as we climbed into the mountains, to disappear again in our descent. North of the Grand Canyon we roamed narrow hi-ways in the dusk, racing against the dark to find our destination of an unmarked, private dirt road at the top of a plateau. After multiple wrong turn offs, we pulled into a secluded sheep ranch as the skies turned into dark shades of blue above the dry grasses and sandy red soil. Baya met us outside of her home, and led us back to her family’s Hogan. The wind was fierce and biting as we stepped out of the car, and inside the Hogan was colder still. I stood shivering on the sandy, dirt floor as she described her Navajo grandmother raising herself, and her cousins in the one room dwelling. A scared place, simple and round in shape with a large hole in the peak of the roof to let the raw metal chimney through, it was lightly covered with glass with the night stars widely visible. 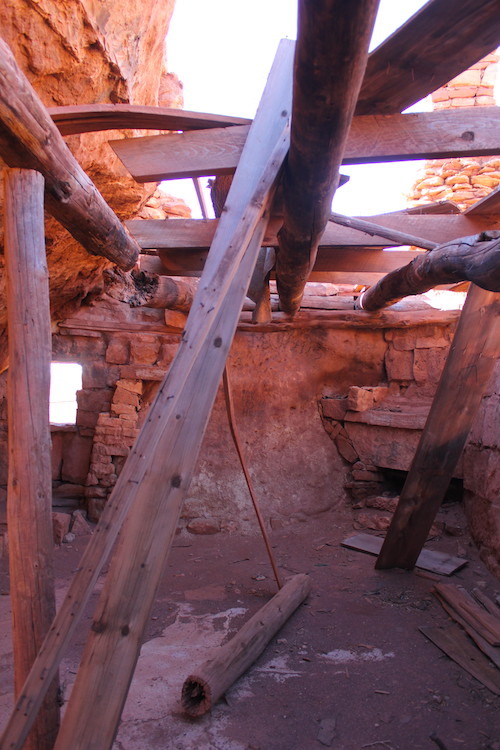 Still used for religious ceremonies, but also a source of income to travelers to come into intimate contact with the Navajo culture and traditions. The steel drum stove sat in the middle of the Hogan, two cots along the walls, a table with a smattering of camping gear, and a large pile of wood kept us company. Once the fire caught, the space warmed quickly. We hopped across the sandy floor trying to keep the grains out of the bedding, arranging the few mats around like we were children playing the ‘lava’ game. Through the night, the fire would burn away and the heat would seep out of the Hogan quickly. Every hour, the sharp intake of cold air would wake us to continue to feed more wood into the fire. My dreams became strange. Naked, standing in the high plateau desert I was weighed and measured by ancient gods, all parts of my soul taken apart and littered across the land. In the morning, we found a gorgeous great Pyrenees sheep dog sleeping at our door, as Baya brought us blue corn pancakes, a fruit compote, and coffee. Paul, Baya’s husband, took us out to an overlook of the canyon of the Vermillion Cliffs, describing his wife’s ancestry and connections to the land. The space, feel and experience was one that traveled much greater depths than simply driving fast across the land. The deep down grit that seeped into my pores gave me far more to reflect on than a comfortable night stay at the Hilton.